First, collect a few items at the beginning of the stage, most notably the second free W-tank. All the eight Robot Masters are in the locations as below. 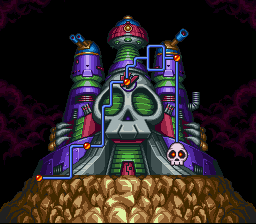 Make sure you DO NOT use any E-tank nor the S-tank: you will need all five of them against Dr. Wily's Capsule. Fight the hardest robots first, so that the later ones allow to restore energy. Slash Man Freeze Cracker He gets frozen, then he performs an attack that is hard to dodge. Shade Man Wild Coil No particular reaction. Freeze Man Junk Shield He gets frozen, then he keeps fighting. Turbo Man Noise Crush He gets stunned, then he transforms and perform his dash attack. Burst Man Scorch Wheel He jumps back and drops four bombs (easy to dodge). Cloud Man Danger Wrap He gets stunned, then he is easy to hit again before he performs another attack. Junk Man Thunder Bolt He gets stunned, then he performs an attack easy to dodge. Spring Man Slash Claw He gets stunned, then he performs an attack easy to dodge. 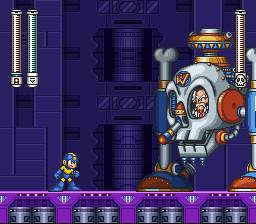 After defeating them, a teleporter will appear allowing you to travel to Dr. Wily himself. I recommend focusing on dodging and destroying his little creatures. Throw in a few good hits when you can, but think defensively. The charged Mega Buster shots will do just as much as a Thunder Bolt, so use them to take him down quicker. Again, DO NOT use any E-tank nor the S-tank: you will need all five of them against Dr. Wily's Capsule. Bounce Crush: Hops across the room, if caught underneath his chin you will feel the pain of the spikes. 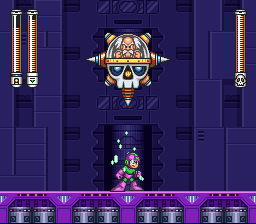 Solution: Slide underneath, this is also a good time to blast Wily in the face. Minion Creation: When he returns (after jumping off screen) he will throw out two replicas of the robot which will try to crash into you. He will slowly walk across the room, about 1/4 of the way across, he will leap the remaining space and smash you if you are in the corner. Often when you destroy the robots, he will rush the rest of the way instead of slowly hopping. Solution: Blast them away and watch out for Wily. Use Junk Shield to remove them easily. If you charge it up and press , you should be able to hit him even when he appears at the top of the screen. Blast him when he appears, since he becomes invisible between attacks. Have fun, he takes 28 normal hits (or 10 charged Wild Coil hits), so this might take a few tries. To eliminate the four balls from being summoned, use Thunder Bolts (strike him), this should increase your health capacity by a lot. Try to hit him with a charged Wild Coil, change to Thunder Bolt (through the menu) and then jump up and hit him with a Thunder Bolt immediately after he stops flashing. This way you will damage him and he won't be able to hit you. If he's too high to hit with your other weapons, remember to raise the height of the charged Wild Coil by pressing UP as you fire. Most likely you will die the first few times when facing this boss. If you have the max amount of spare tanks (four each of E- and W-Tanks to refill your life and weapon energy, and one S-Tank to fill your life and all your weapons at once), you can probably outlast him even if you get hit often. Energy Swarm: Summons four energy balls to come at you, they move in two spurts, each time towards your position. Afterwards, he will send a wave of energy along the ground: two sparks, like Cloudman's attack, in each direction. Solution: If he's within jump reach, hit the capsule with Freeze Cracker or a Thunder Bolt, if possible. Thunder Bolt prevents him from shooting his four balls (Energy Swarm), but not the lightning balls to the ground. The best time to dodge the Energy Swarm is if he is at the top of the screen in one of the corners. If this is the case, simply stand under him, wait for the balls to summon, dash to the opposite corner, and as they chase you, jump over towards them. This way they will be low to the ground and grouped in a way that you can get over all four at the same time (almost in a line). Remember to jump at the right time to dodge the four sparks. This page was last edited on 29 May 2018, at 11:30. This page has been accessed 13,157 times.